Vehicle for self-expression, robot nanny, or an end to free will? 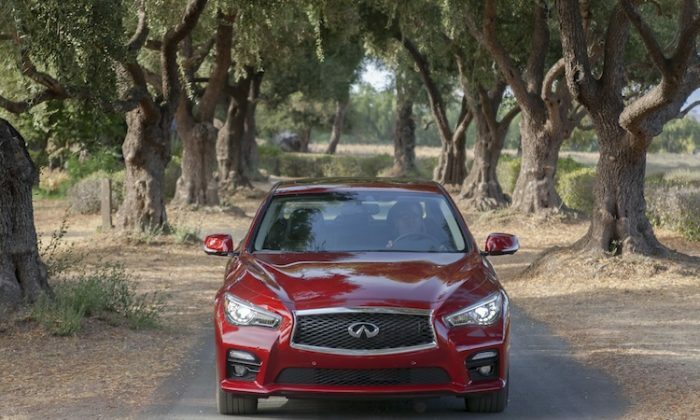 No matter how you look at it, the Infiniti Q50 is the beginning of the end of life as we know it. Yes, it’s called Q and the G sedan will soon be gone forever. But Q would advise James Bond against purchasing the Q50 without adding a significant firewall. The big deal is that the Q50 possesses the first drive-by-wire steering system. Infiniti calls it “direct adaptive steering” (DAS). That’s right. There is no rack and pinion mechanism turning the wheels, at least while the car is on. The steering wheel’s computer talks to each individually controlled wheel by wire. When the power is off, a secondary mechanical steering mechanism engages, both when parked and in case of system failure. Of course now you have the weight of two steering systems, but the car doesn’t feel heavy. In fact, the amount of variation in the steering feel between settings is truly impressive. Any feedback you get is simulated, so if you’d like a ride scrubbed clean of harshness you’ll have it, and vice versa. You can change everything from steering effort to steering gear ratio. I drove both the AWD and the RWD models of this car and I can honestly say they were very different from each other. One I hated, the other was a nearly loved. So here we commence with a few scant words of standard car review prose. DAS transmits information quicker than mechanical steering. So what does that feel like? When you compound minute instructions and crazy stuff like wind compensation from the computer, add to that four powered wheels, what you get is a hyper-accurate, hypersensitive date you want to dump before your steak and lobster even arrives. The constant adjustments to even my unwitting input were exhausting. I’m dumping you AWD, or at least not selecting the DAS option with AWD. The drive-by-wire steering in a RWD car was totally different, an utterly drivable rather enjoyable luxury sedan that I actually would have. And I’ll tell you how I’d have it. Infiniti’s “InTuition” system allows the driver to create unique engine, suspension, and steering settings. Don’t think about the semi-useless setting buttons you’ve tried before. This system makes significant changes to driving feel. The standard Sport mode settings in the Q50 were given the nod by Sebastian Vettel, Infiniti’s new director of performance. But sometimes even that level of greatness can grow tired. I’d like a week alone with Scott Dixon’s settings. The James Hinchcliff settings ensure the car will start everywhere but your hometown. I’m a woman, so I’d want to try the Danica Patrick settings. It’s great—the car only turns left, really well. All joking aside, this car ushers in a significant technological shift. What you think you are getting is options, but what you are losing is your humanity. DAS is a key piece of technology needed for the driverless car. Nissan, parent of Infiniti, just won the top prize at the CEATEC Innovation Awards in Japan for autonomous driving technology. In fact Nissan is hoping to have an entire lineup of vehicles that drive themselves by 2020. We are told this will provide greater safety to humans, fallible things that we are. We all know that computers are absolutely infallible by comparison, right? In the Q50, DAS enables most components of its “safety shield” like Active Lane Control, Blind Spot Intervention, Forward Emergency Breaking, and Backup Collision Intervention. An advance system of sensors informs all of these features—they are the nanny’s eyes and ears (ding, ding, ding). We have now officially moved from “warnings” to “intervention” and that appears to be great. If you can’t stop, Nanny’ll do it for you. If you can’t drive between the lines, she’ll fix that too. But you can’t get something for nothing (cough—2001: A Space Odyssey). What we are forfeiting, and there is no reason to blame Nissan/Infiniti in particular, is our freedom. We are losing freedom and control and substituting it with a placebo of both. Text while you drive, the car will save you. Don’t learn to drive properly, the car will save you. Everything should become more and more comfortable because we are not passive and overweight enough. It’s time to admit the car will soon be a cradle for increasingly useless adults (cough—eWally). Boris Grishenko was the evil hacker in the movie “GoldenEye.” Remember? What they found was that by using the CD player, Bluetooth connectivity, GPS, Satellite Radio, or OBD-II port to remotely access a CAN bus inside a modern car, they could control parts of the car, like brakes, acceleration, and headlights. The only thing the researchers could not hack into was the steering—because it was mechanical. DAS means that now, that’s up for grabs too. Even scarier is that if you mess with the code and cause an accident, you can erase any hint of the malicious command. They did all this without actually touching the car—two years ago. Not only are cars soon to be as customizable as phones, they will be as unsecure. In 2011, those same researchers were able to hack into cars and make their audio systems record everything said inside the car. Why didn’t you hear much about it? I read “Comprehensive Experimental Analyses of Automotive Attack Surfaces,” and if you Google it you can too. But asking difficult questions is not what automotive journalism is about these days. It’s about free flights to resorts with fancy dinners, shiny new cars, and derivative rehashes of spec sheets. Yeah, I said it. I test-drove the Q50 while being wined and dined in a fantastic resort in Muskoka. I hung out around the campfire with the wonderful, kind-hearted, hardworking, and sincere folks from Infiniti Canada. Writing this is breaking my heart. No matter how it drives, this car concerns me. It is not the car for political dissidents, whistleblowers, or activists. In fact, if you work on the China desk of Epoch Times, I’d advise against it too. If someone has the considerable time and money it would take to hack into your car either to monitor you or cause you harm, and you think it remotely likely they will, get an old car. If you are a mild-mannered citizen looking for a fun luxury sedan, get the rear-wheel drive hybrid. At C$47,000 it’s slightly less than the Sport model with the 3.7 L V6, and apparently it’s the favourite of the Infiniti staff. Think mountains of torque from the electric motor, plus rear-wheel drive, fun settings, and awesome fuel economy. The real price we all pay for expensive robot nanny cars is considerable. The cost of replacing dozens of expensive computer systems will make cars increasingly disposable. The objective of the automotive industry is to sell more cars, not make great cars that will last forever. Planned obsolescence is real. I can’t just say goodbye without offering solutions. If you are on the run from baddies, take public transit, ride a bicycle, or own a late ’90s sports car. If you want to save the environment, do all those things too. The environmental toll of buying a new car, hybrid or otherwise, is huge. I guess driving will soon go the way of voting, and it’s sad.